4 Hugues Ross - Blog: Making the first Halberd game: Story Time! If you haven't read this post, do that now. I'll wait. The first step to making a successful game is coming up with a good title, clearly. I spent a solid 10 minutes or so trying to think of a good legally-distinct title involving words like "dragon", "knight", and so on before remembering that I can just rename it later. So, let's just be lazy and call the game Henry for the time being. With that nonsense out of the way, we can start designing the game for real. Normally it helps to start a game with some prototyping, but that's not yet on the menu with Halberd. Instead, let's talk narrative. Warning: Actual writers may want to skip this bit, to avoid the aneurysms my... process... will cause them. Why is the knight slaying the dragon? 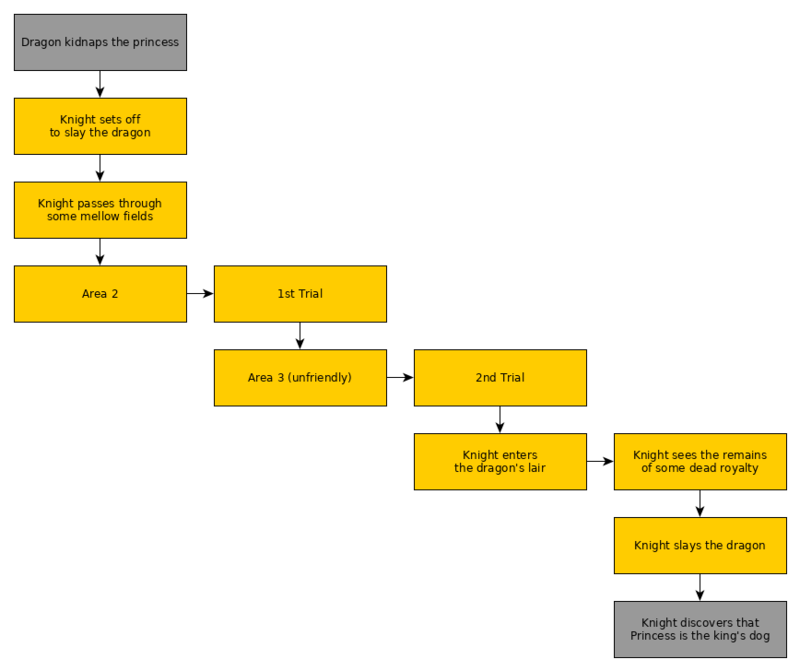 What must the knight do to slay the dragon (besides the obvious)? You'll notice that these questions fill gaps before, between, and after the 'story'. Let's tackle the 1st and 3rd. Motivation - Why slay the dragon? We could go on, with more ideas and deeper motives and circumstances. Of course, we couldn't depict most of that well with Halberd as it is. Let me instead reach once more into Ye Olde Bag of Cliches, and The dragon kidnapped the king's princess. I don't want a totally boring story, though. 'Princess' is also used as a dog's name on occasion, so that might be a pretty achievable twist. Conclusion - How does it all end? We now have a knight, a dog, and a dragon. The little twist we just set up will provide a decent ending as well, so that can go at there. We can push it even harder, too. Since the player will likely expect a human princess, we can imply certain (wrong) things by stacking up some bones and a crown just before the dragon, and make the surprise even bigger. I'm not cocky enough to try recreating the entire Monomyth in 10 minutes of lukewarm gameplay. Still, it's a good reference for brainstorming an RPG plot. Look back at the existing story points, and you'll see a couple similarities already. Most examples involve some transition from the known/safe to the unknown, then back at the end. This seems doable through environments alone, by starting the player off somewhere 'happy', like some lively woods or plains, then moving on to more foreboding locales. There's a lot of events involving 'trials' and hardship around the middle. I happen to know of a couple simple events that could be made possible in Halberd, so I'll probably use those in the middle two areas. With this, we now have enough story to begin the game for real. Next time, we'll begin making some content.